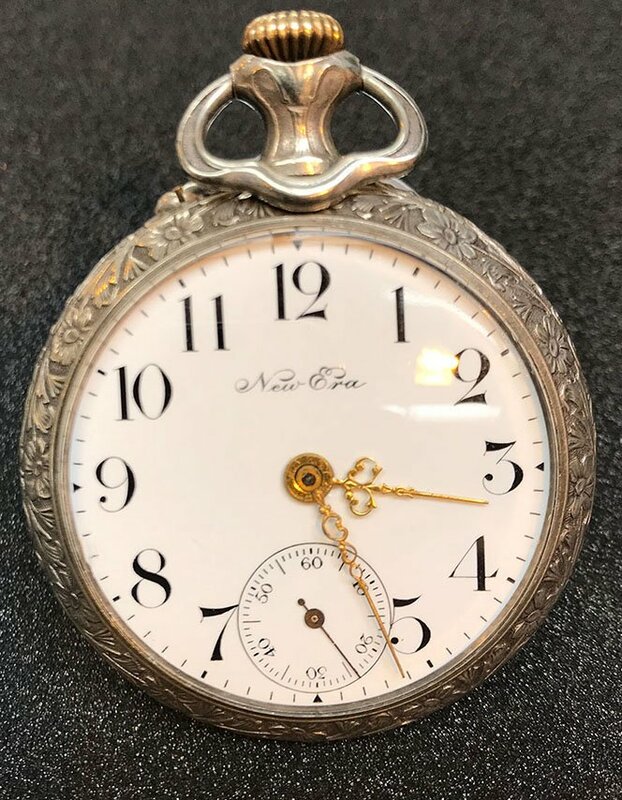 A superb mechanical wind aeroplane cased pocket watch , Circa 1900. 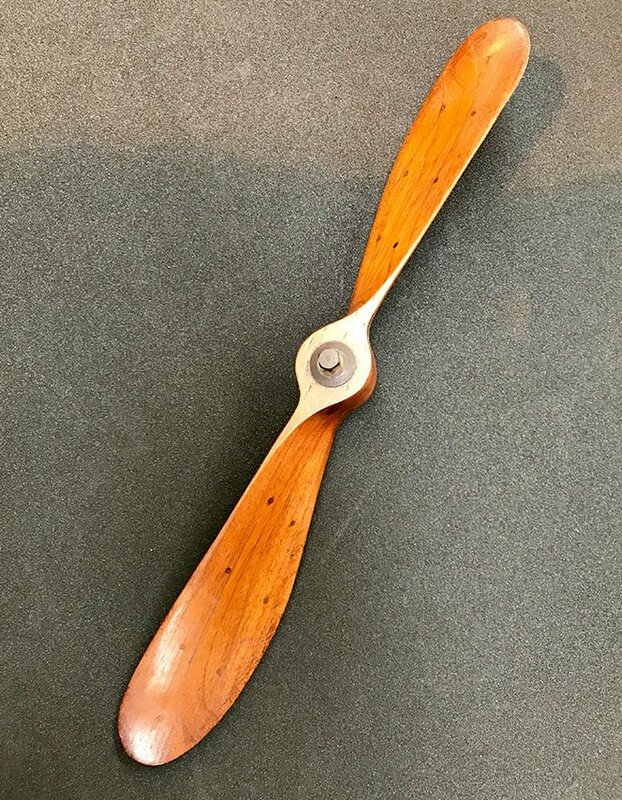 Small wooden propeller used for driving a generator or Pump with central bolt and washers. 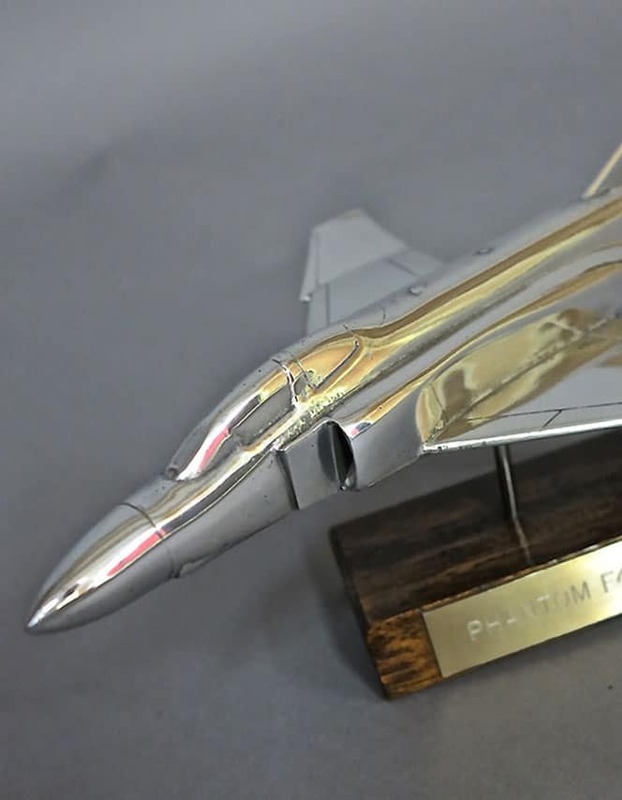 Fighter Jet Tornado GR4 Pitot tube. 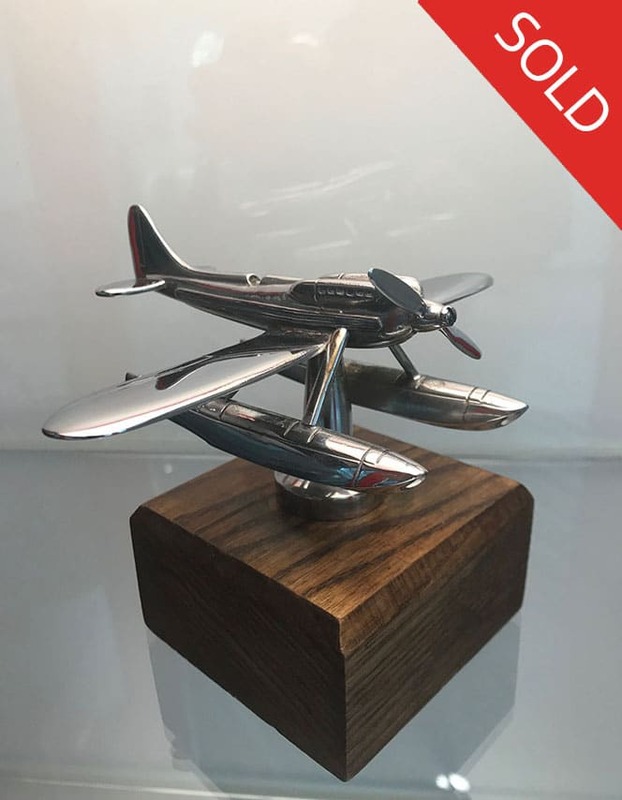 Own a piece of aviation history! 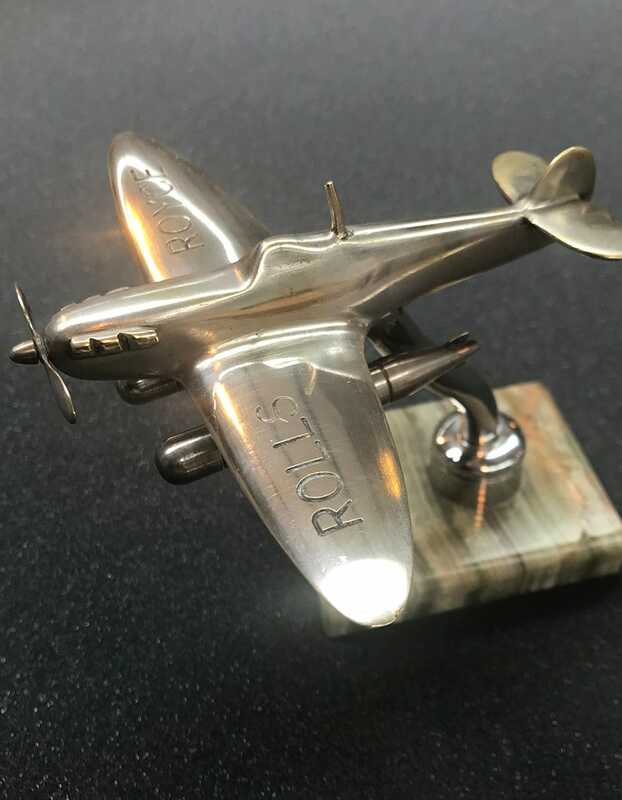 Chromium- plated on brass, the inscription Rolls Royce embossed on the wings. 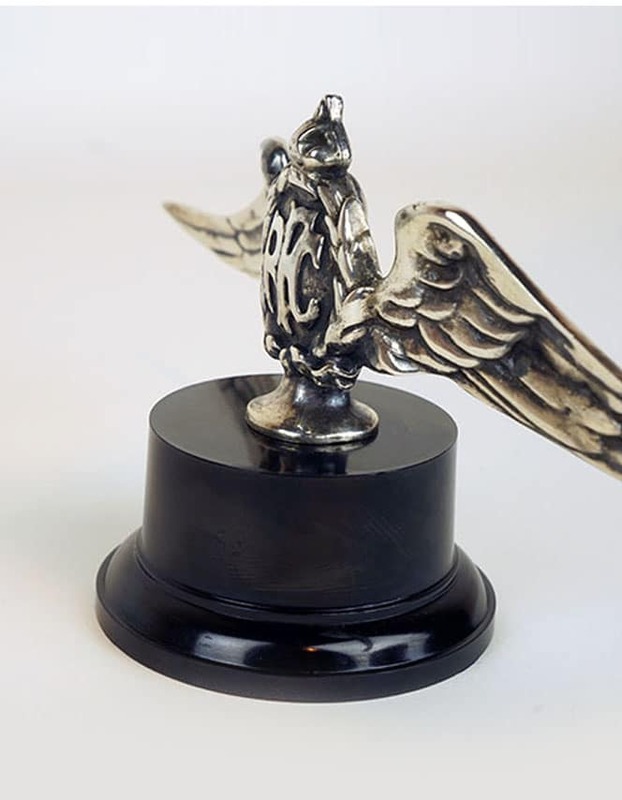 Features an impressive 10.75 inch wingspan, bronze construction with nickel-plated finish. 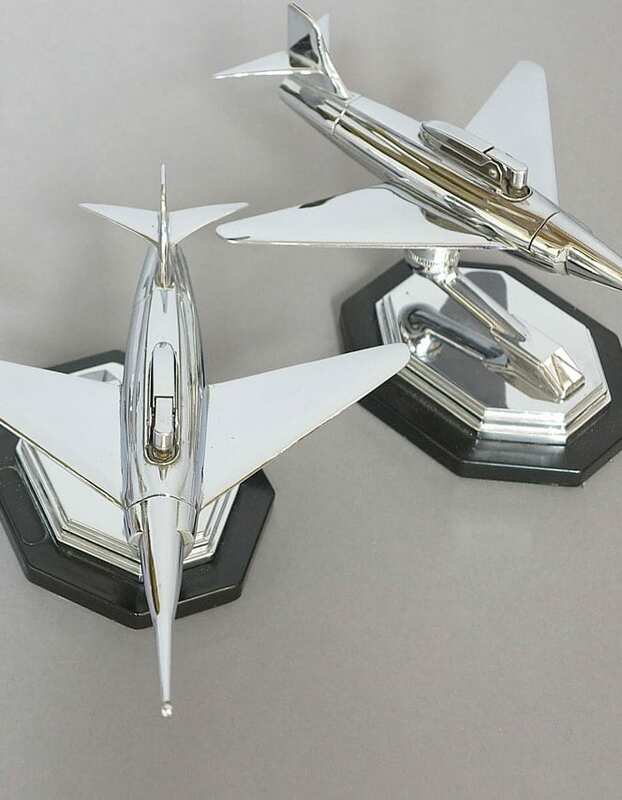 Chrome-plated. c 1930s period depicting a Spitfire in banked position, with integral display loop mount. 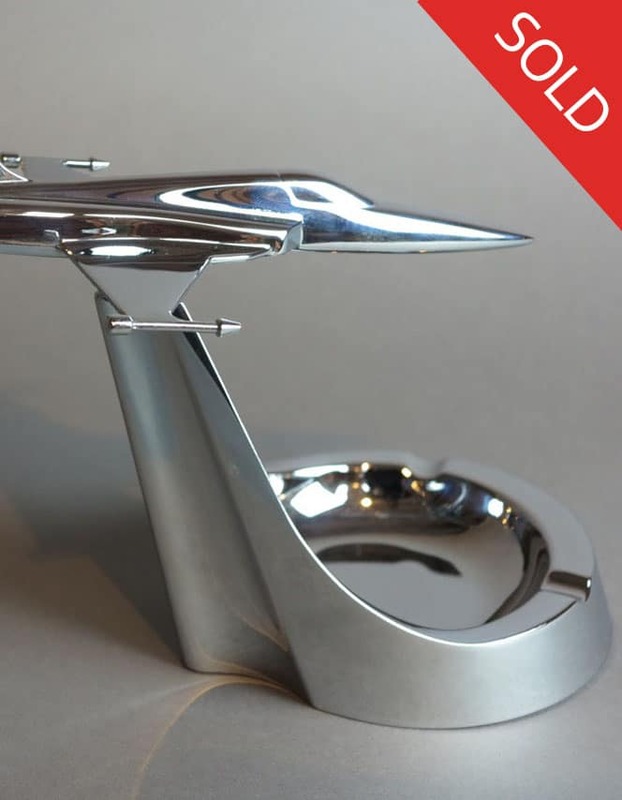 A Superb example of the Dunhill Jet Fighter Petrol/ Wick Table Lighter in Polished Chrome. 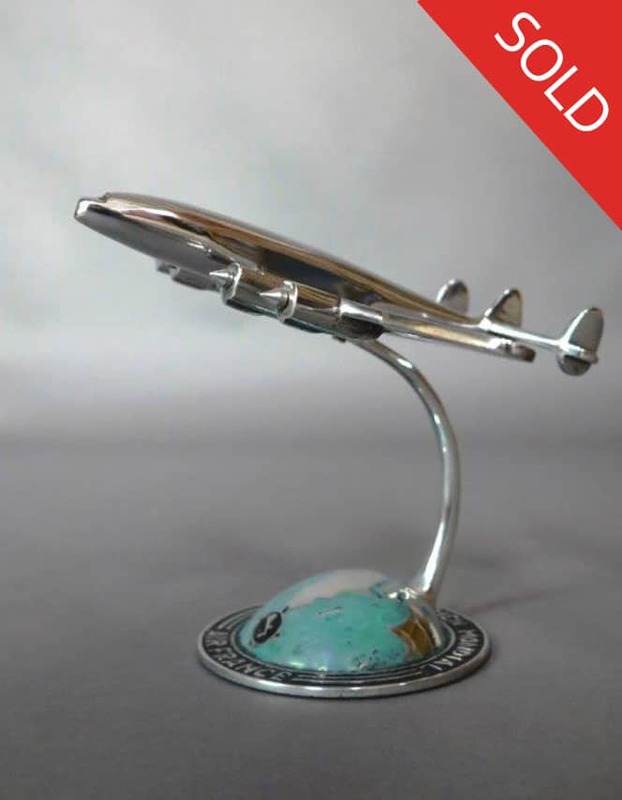 Cast from a piece of aircraft metal the model has been highly polished and mounted on a wooden base. 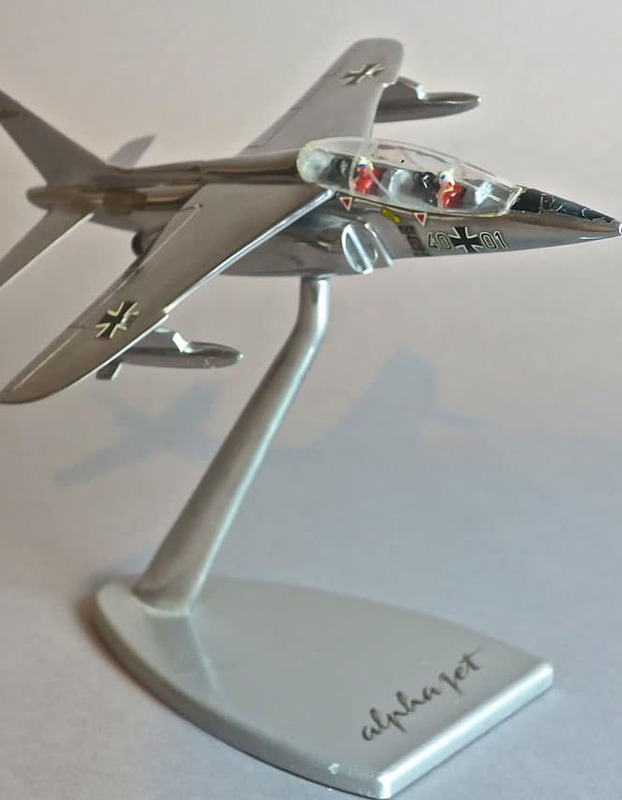 A promotional rare military production desktop model of the No 1 Flights squadron. 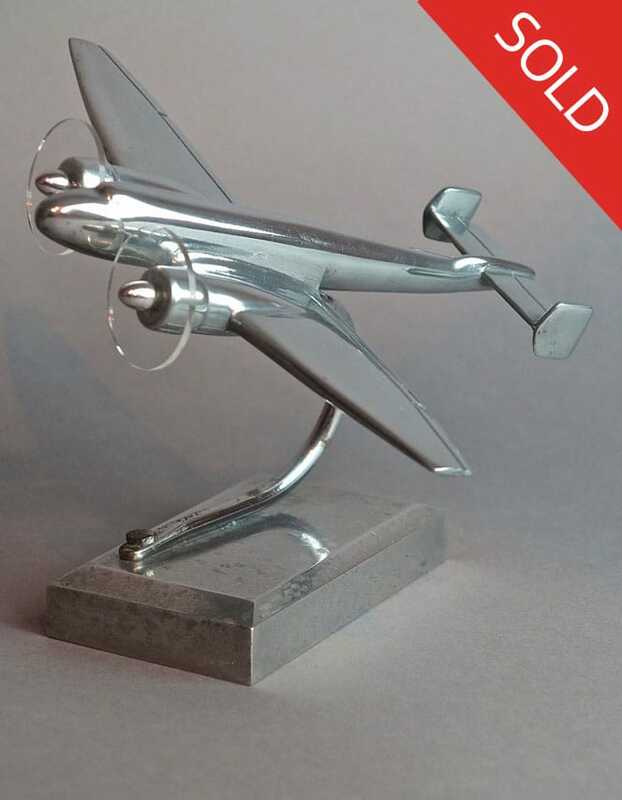 Highly polished, made by the Dutch model airplane maker Matthys M Verkuyl. 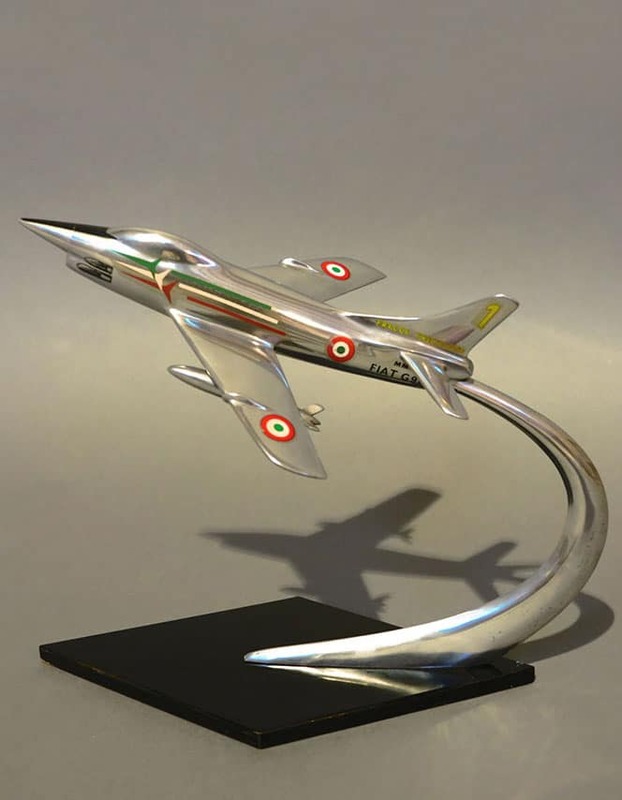 The dimensions of the model of the Alpha Jet 21.5 x 26 x 19 cm. 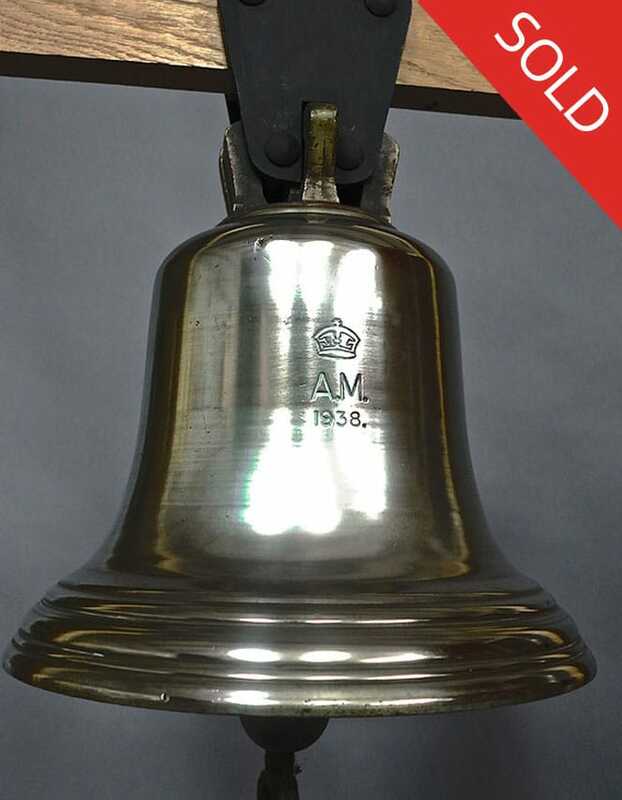 The model is in very good condition. 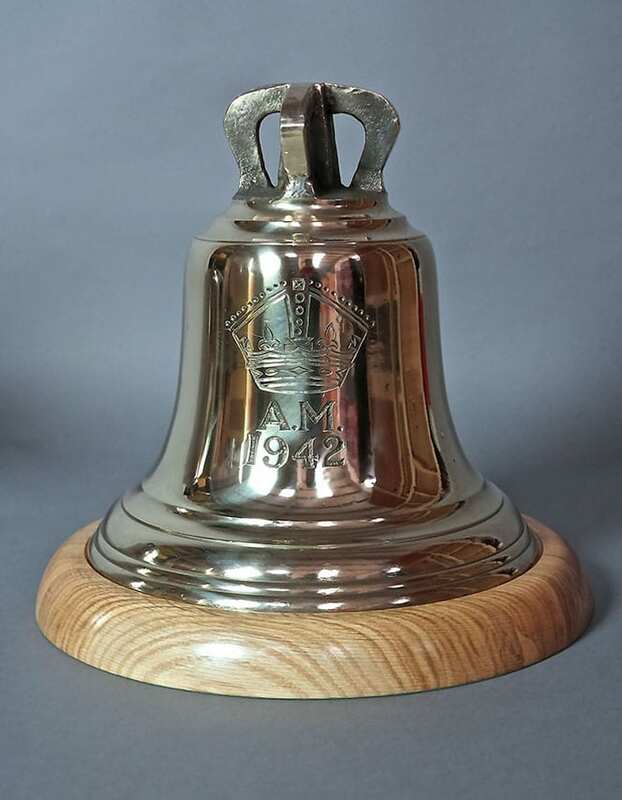 Chromium- plated on brass, the inscription Rolls Royce embossed beneath the right float. Circa 1940. 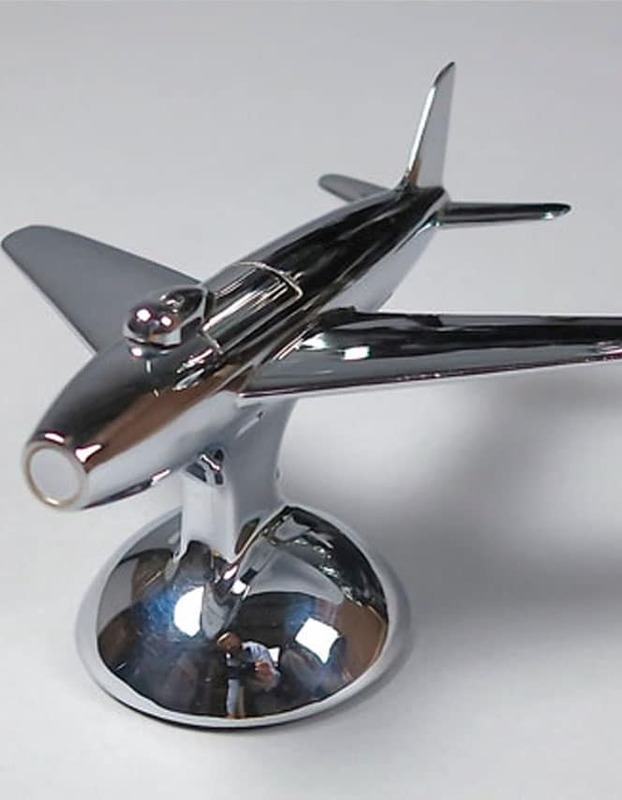 Superb chrome jet airplane with built in lighter on pivoted ball socket on black bakelite-like base. 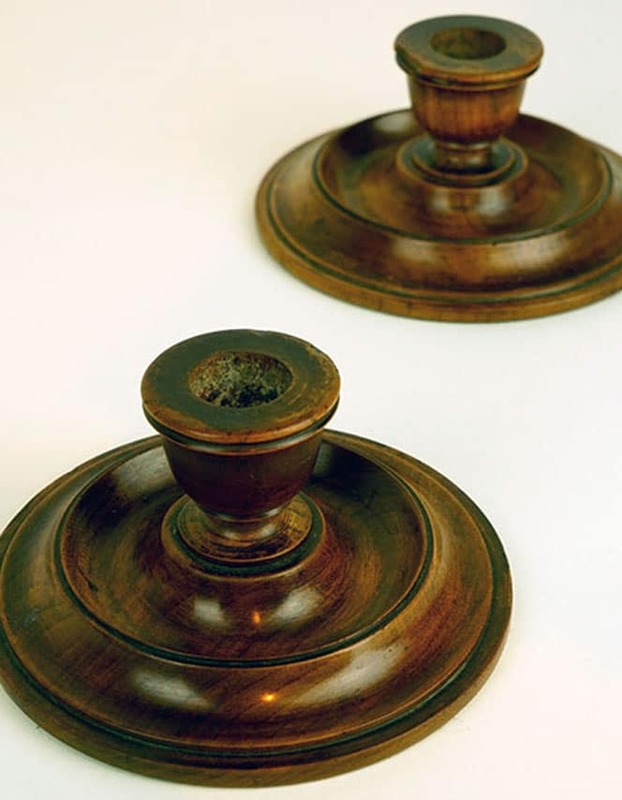 A pair of turned wood candlesticks, manufactured from Second World War aircraft timber. 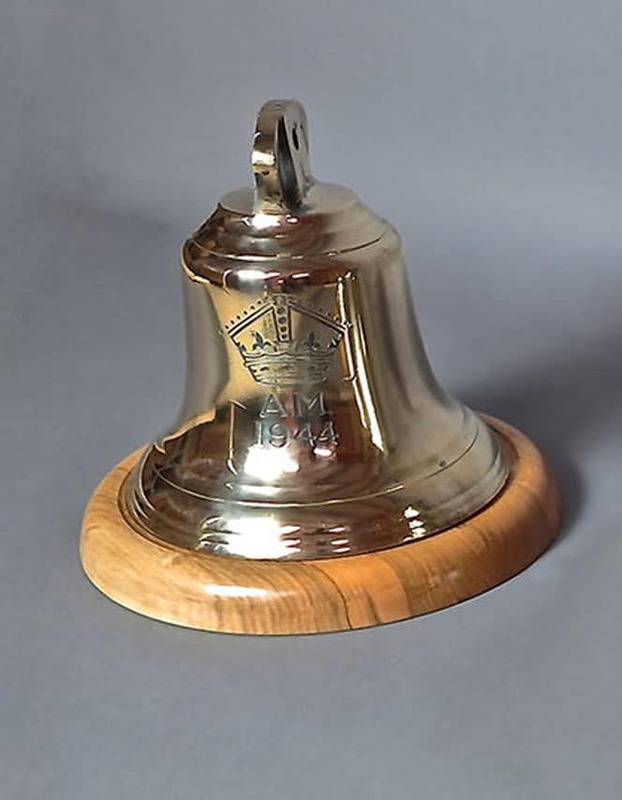 A majestic Royal Air Force station Nickel plated ‘scramble’ bell, in service at the start of World War II. 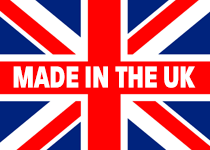 Designed by Intrepid Design using parts from a Harrier Jump Jet engine. 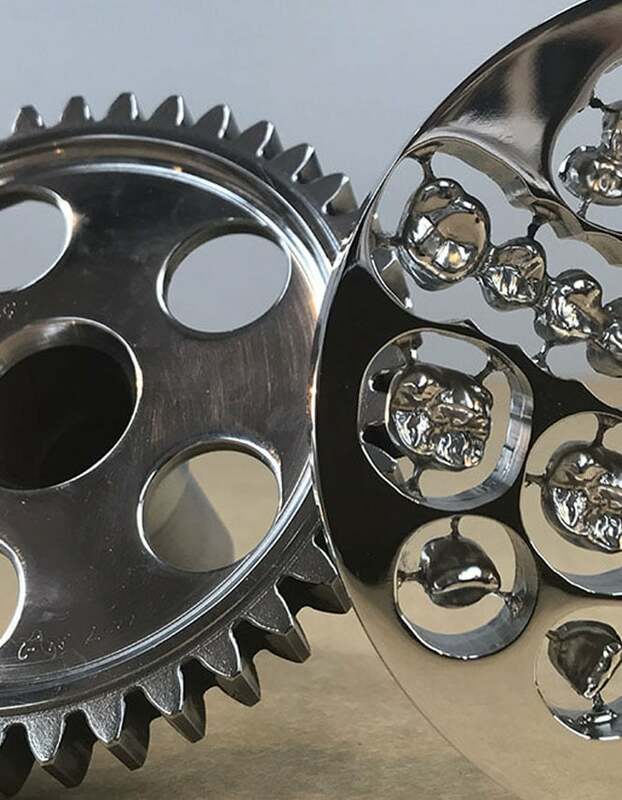 Highly polished metal for making dental prosthesis. Cn be used as coasters or simply as tactile pieces for Dentists. 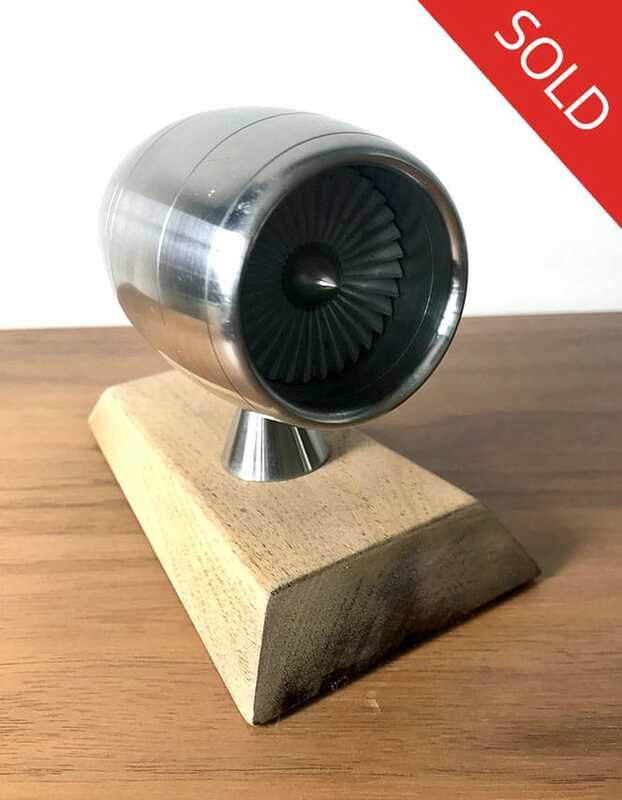 A hand built model of a jet engine with spinning turbine. 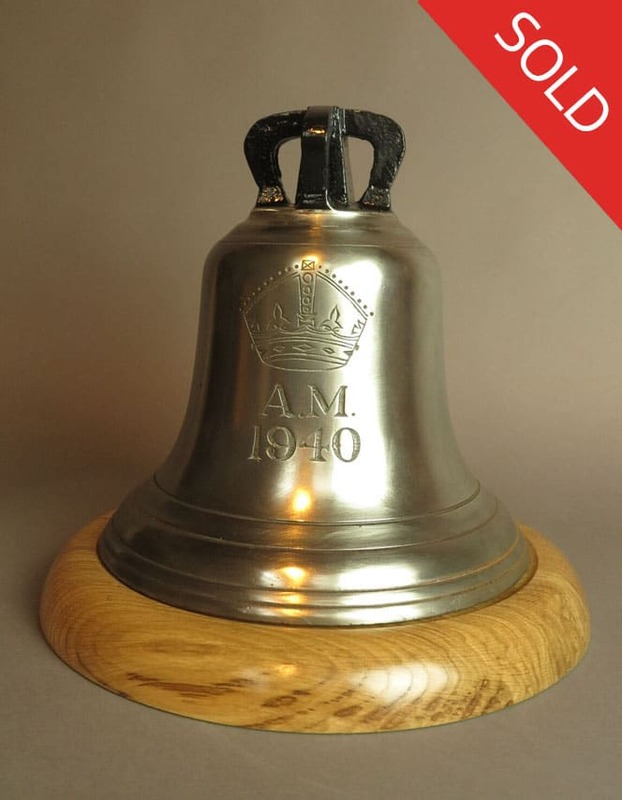 Mounted on a wooden stand. 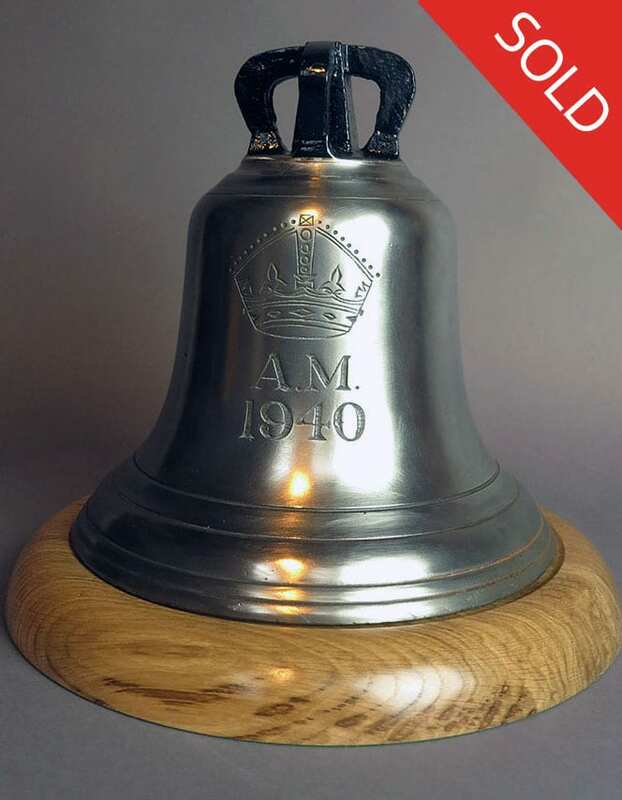 A majestic Royal Air Force station LARGE bronze ‘scramble’ bell, in service at the start of World War II. 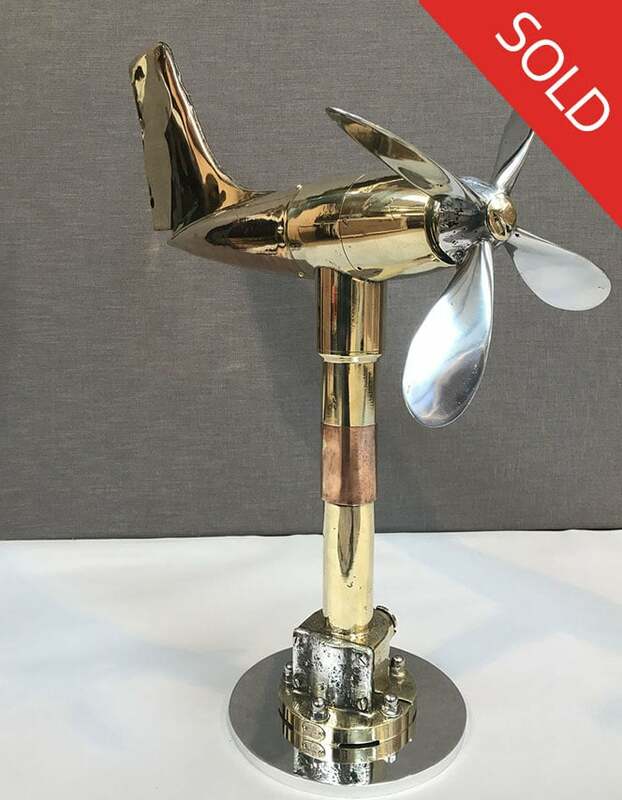 A vintage brass anemometer / wind direction indicator, fashioned as an aircraft fuselage. 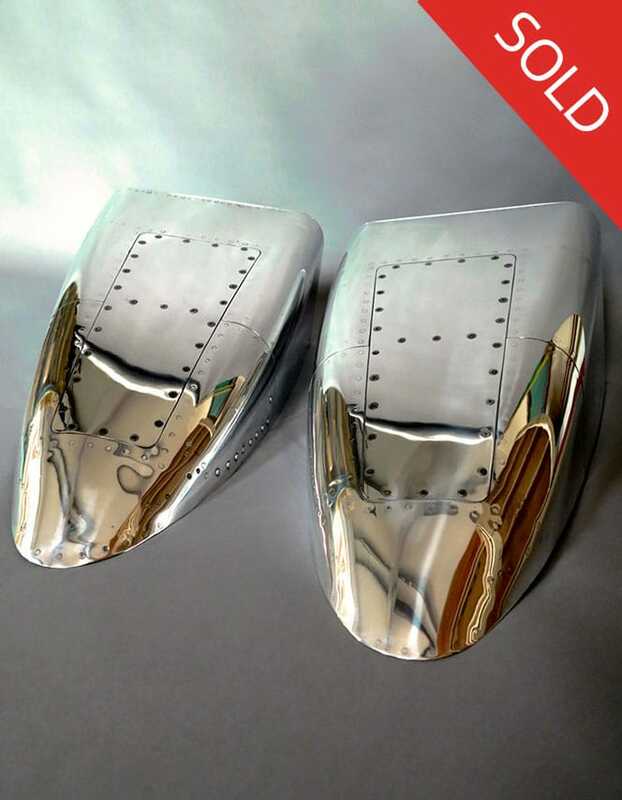 Highly polished air intakes with custom wall brackets makes these pieces wonderful wall brackets. 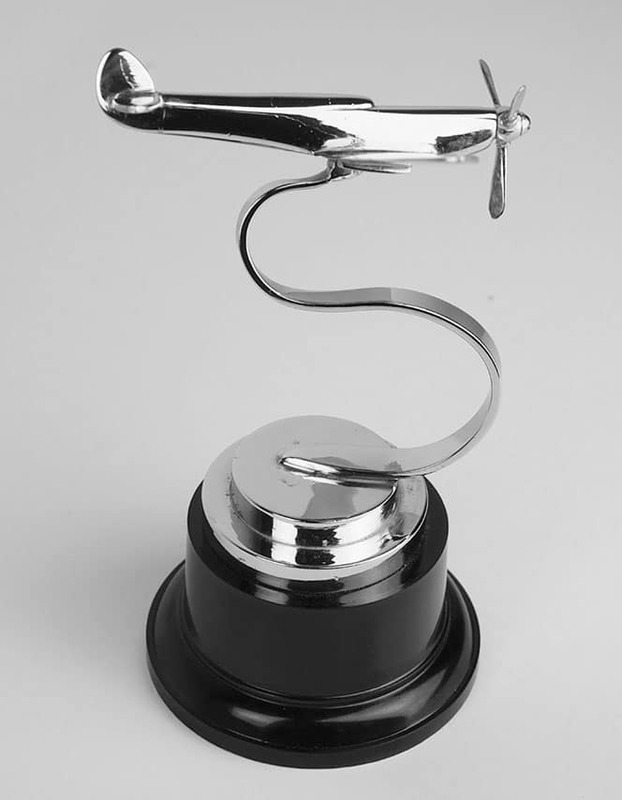 Model of single-engine propeller aircraft, presumably a North American B25 Mitchell. 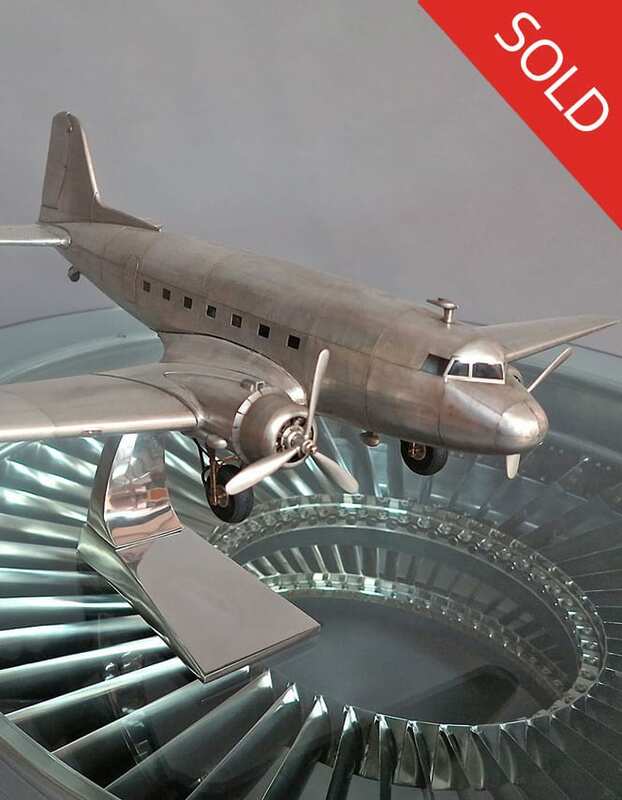 A rare and highly collectible model of a DC-3 aircraft. 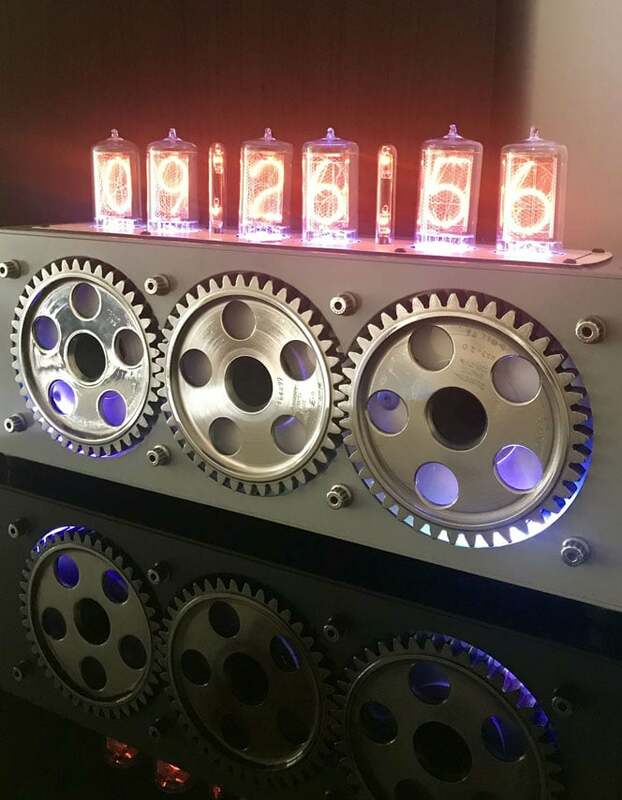 A very nice piece. 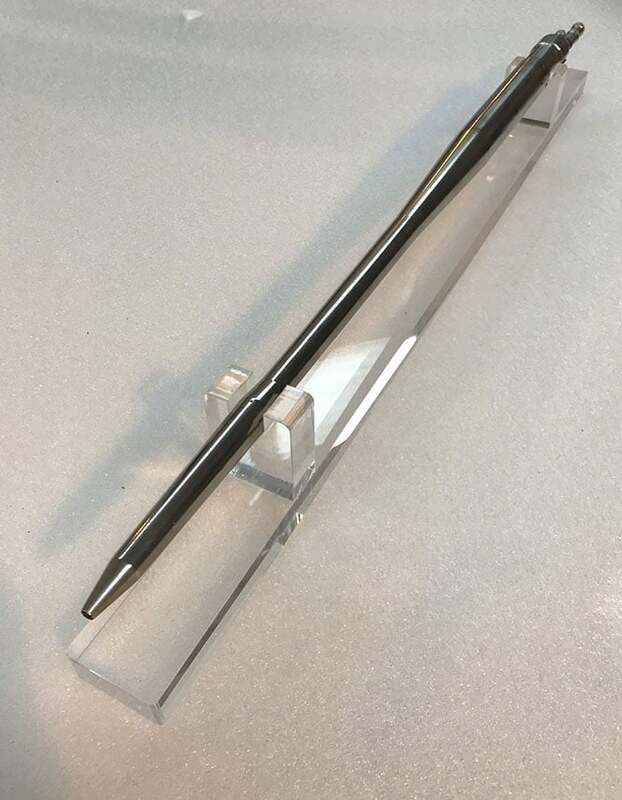 Mounted on gadrooned stand. 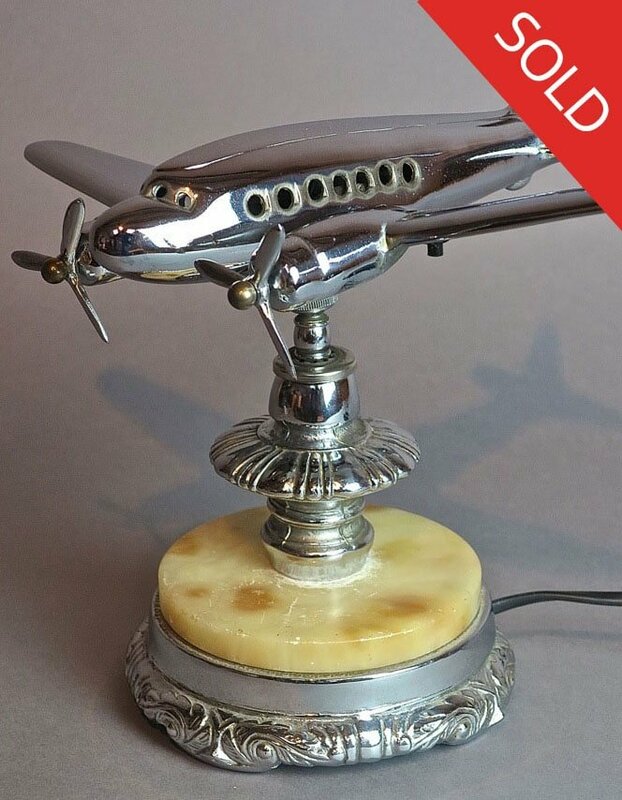 Chromed metal, alabaster base. Electric light. 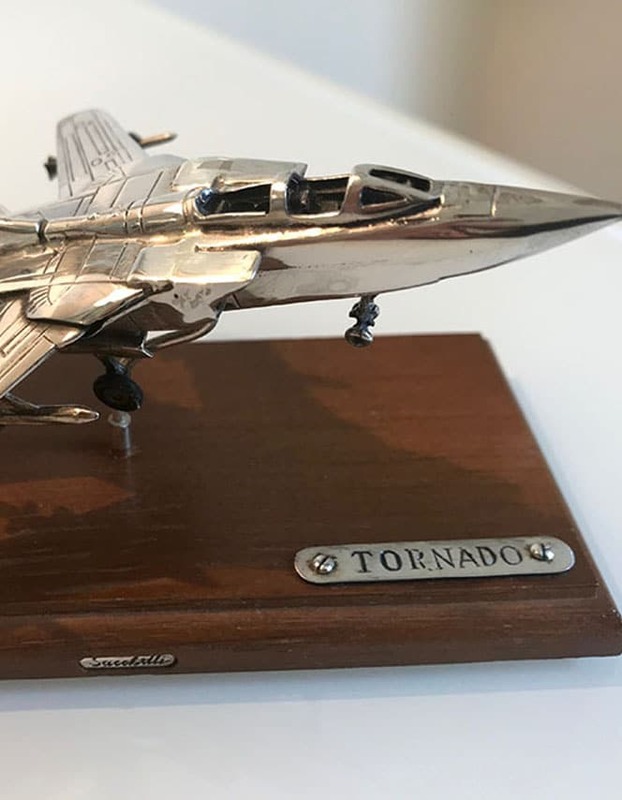 A model of a fighter jet, a Northrop F-5 Tiger, is mounted onto the dynamically shaped ash bowl. 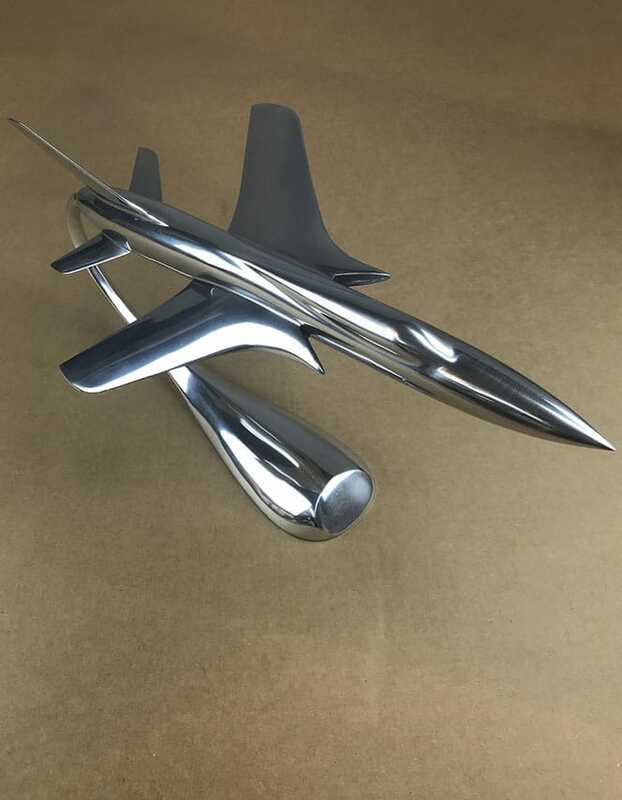 This aircraft, in the style of a Constellation Aircraft has been highly polished and re mounted on a “World Base”.